Only a 50-minute drive from Smithton in the far North West of Tasmania, Arthur River Holiday Units offer the ideal accommodation to experience this pristine Tarkine wilderness area. Situated on the banks of the picturesque Arthur River and close to the ocean and beaches, you can relax and enjoy the peaceful surroundings of this coastal village. Arthur River Holiday Units are spacious self-catering, one and two bedroom units providing a home away from home with off-street secure car parking. The Arthur River Shop is on site. Cruise the Arthur River with your hosts on board their vessel ‘M.V. Reflections’ offering the experience of pristine wilderness, waterfalls, sea-eagles, azure kingfishers, rare tree orchids and many more surprises. Beaches are within walking distance and there are brilliant sunsets to capture. Visit the Edge of the World and throw a pebble into the Southern Ocean or fish for salmon or trout. 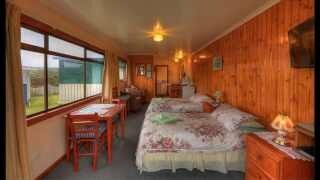 Short distance also from Tarkine Forest Adventures and Marrawah with its surfing beaches and local Tavern. Arthur River Holiday Units also offer value packages containing accommodation and river cruise. Amenities include satellite television, wood and gas barbecues. One Bedroom self-catering unit has a deluxe queen-size bed with comfortable linens. Unit also has sofa bed, electric heating, satellite television, continental breakfast provisions are available. Car parking outside door, ground floor. Two Bedroom self-catering unit suitable for two couples or a family of four. It has an ensuite bathroom, lounge/kitchen area. Heating is woodfire or electric. Main bedroom has deluxe queen-size bed, second bedroom has two single beds. Kitchen has full cooking facilities and microwave. Unit has satellite television, continental breakfast provisions are available, car parking outside door, ground floor. One bedroom self-catering unit has ensuite bathroom, lounge/kitchen area. It has electric heating, satellite television, bedroom has twin beds with comfortable linen. Unit has views overlooking the river. Car parking outside door, ground floor.